But let me begin at the beginning, before I zoomed down a ¾-mile zip line on Kauai, the westernmost of the well-populated Hawaiian Islands. I had never been to the so-called Garden Island, but I knew it by reputation. 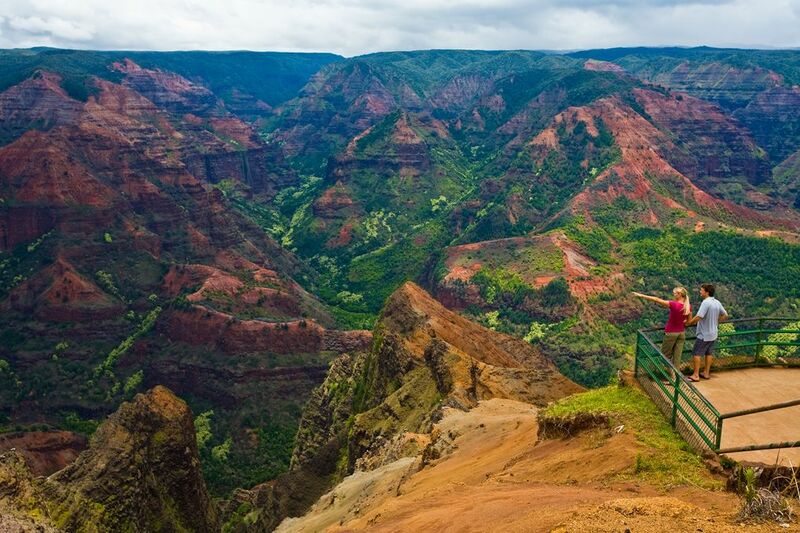 Less built up than Maui and Oahu, Kauai is blessed with spectacular hiking trails, secluded beaches and dramatic vistas. That made it an ideal warm-weather destination to rev up and unwind, while talking to residents opened my eyes to Kauai’s history and the consequences of more mainlanders visiting the island. Were I to visit Kauai again, I might concentrate on a particular pastime. But on this trip with friends, I tried both exciting and relaxing activities. Which brings me back to my midair moment, courtesy of the FlyLine, a special zip line operated by Outfitters Kauai, which also offers kayak, bike and stand-up paddleboard tours. The company has several zip-line packages. Looking for thrills, we chose the so-called AdrenaLine excursion. It began with a pair of conventional zip lines, which allowed us to soar over the trees. Then some of us stripped into our swimsuits and jumped off a mini zip line into a water hole hidden in the muggy jungle, where we gaped at tropical plants with fronds longer than my arm. The biggest thrill came last, however. The FlyLine starts atop a wooden tower several stories tall. Below is Kipu Ranch, where the movie “Jurassic Park” shot scenes. Strapped into a hammock-like harness, I swung horizontal, then swooped across the valley in a superman pose. Outfitters Kauai says zip liners reach 50 mph. Others in the group were less scared than I. They coasted down in serene style, extending their arms like birds. Speaking of birds, chickens rule Kauai. Scientists believe their numbers surged in 1992, after a hurricane destroyed farms, setting birds free. 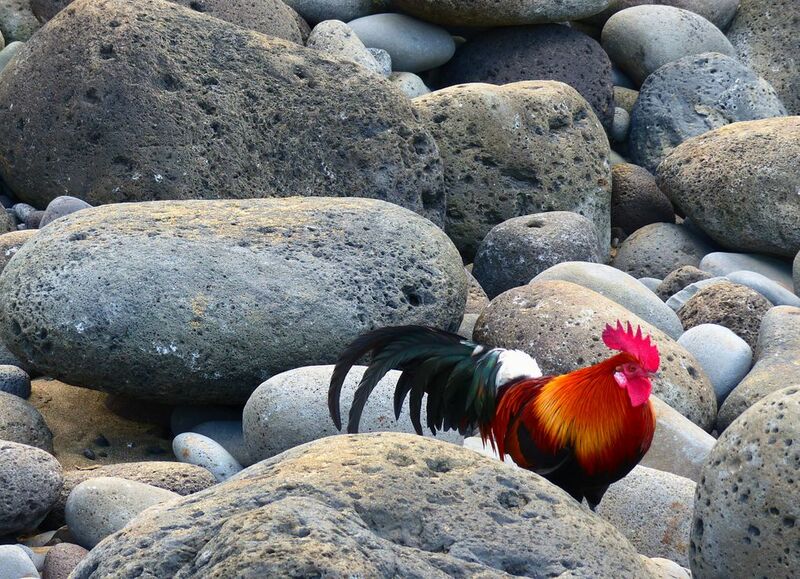 The strangest spot I saw a rooster was Hanakapi‘ai Beach, a rocky cove 2 miles up the renowned Kalalau Trail. 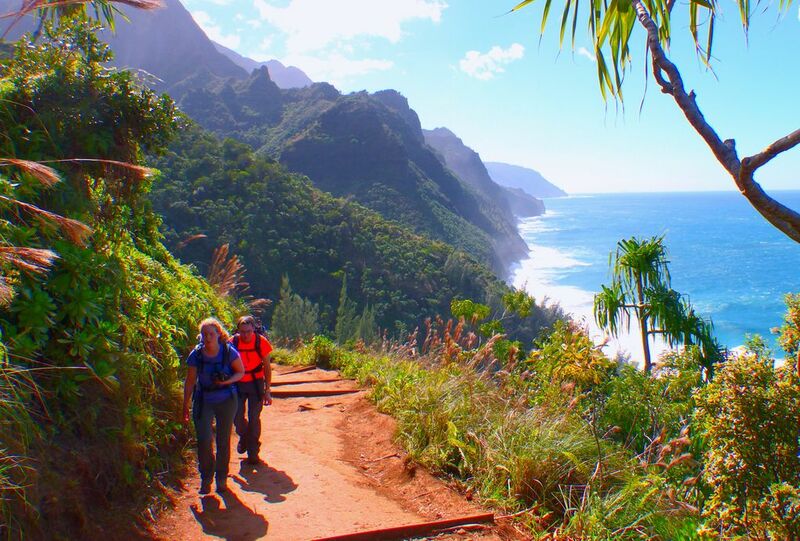 The trail runs along western Kauai’s Napali Coast, where sparkling waves crash spectacularly against plunging mountains. Learn island's mystical backstory at Kauai Museum. To get there, drive counterclockwise on the island’s outer highway until you run out of road. We stayed in Kapa‘a, on the east shore, and the drive took us about an hour. 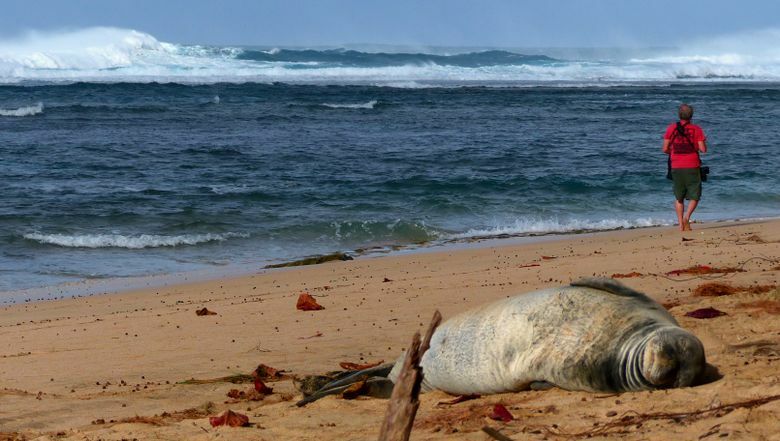 Next to the trailhead is Ke‘e Beach, where we watched an endangered Hawaiian monk seal enjoy a nap on the sand. The sun was out for our hike, which made the coast’s colors really pop. Rest breaks are the best part of the trek, thanks to the views: The ocean couldn’t have been more blue and the hillside couldn’t have been more green. Tropical flora — lauhala and banana trees, ohia lehua and ti plants — offer shade and wonder. When hiking, you can expect to sweat. There are steep sections and my boots grew heavy with squelchy, red mud. Budget about an hour per mile, bring water bottles and take care not to slip when crossing Hanakapi‘ai Stream. Serious hikers can trek the entire 11 miles in to Kalalau Beach, but our 4-mile round-trip was plenty dazzling and tiring. When you return to the trailhead, you’ll be ready to kick back. 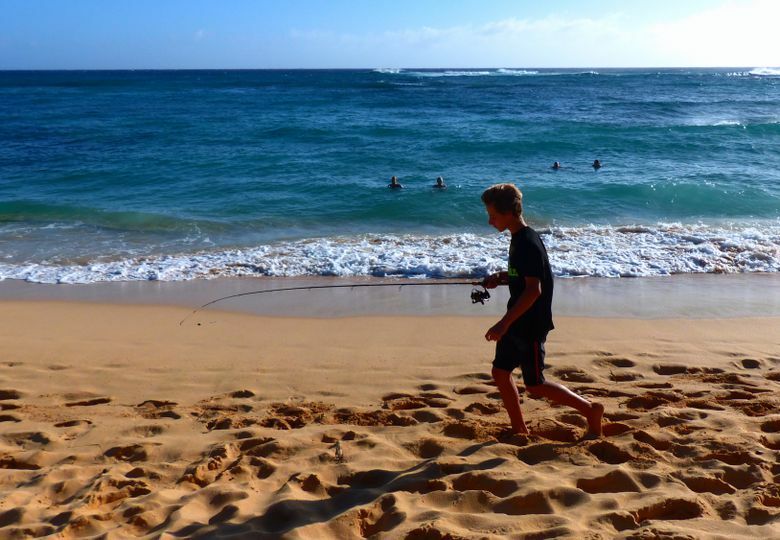 That’s easy on Kauai, because there are quiet beaches everywhere you go. The strand we’ll remember best is the crook of Lumahai Beach by Makahoa Point. Park your car in the unpaved area on the ocean side of Kuhio Highway just west of Hanalei, where the road takes a sharp twist. Then look for a gap between the trees, where a path leads down to the beach. You’ll see smooth yellow sand, frothy surf and jet-black volcanic rocks being pummeled by waves. When we were there, waves washing over the rocks had created a sandy wading pool. The beach appears wild and remote, and for about an hour, we were alone. Though the quiet stretch is no secret, it was easy to pretend that it was. We decided to stick to the shallows, partly because there was no lifeguard. Many Kauai beaches have signs warning about dangerous riptides and Lumahai is known for strong undertow and currents that make swimming here dangerous. Rather than swim, we stood knee-deep in the sparkling tide, listened to the ocean and drank in the scenery. The other end of Lumahai Beach, where a river meets the ocean, is also pretty. But a parking lot and easy access make it more crowded. 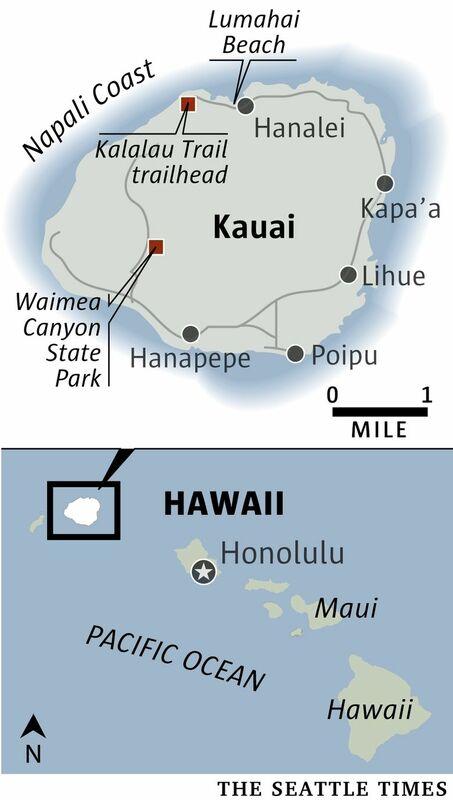 That’s the overall trend on Kauai, where tourism has surged in recent years. Though the island relies on tourism, its residents are dealing with more traffic, more construction and more visitors who have a lot to learn about local history and culture. “The taro patches were always here but the rest was all bush,” said Keola Yokotake, talking about development near Hanalei. 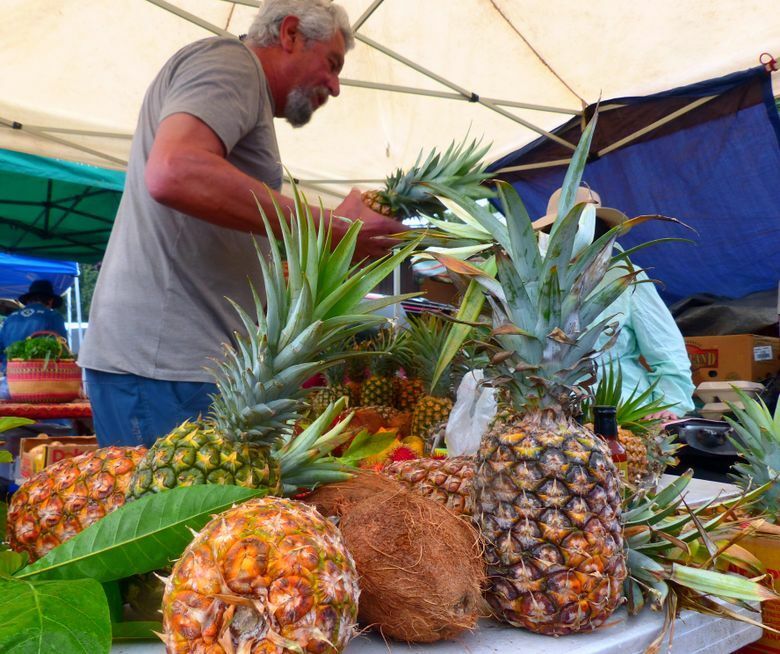 Yokotake sings Hawaiian songs and plays ukulele at Hanalei’s Saturday Farmers Market. “People aren’t too happy about the traffic. We never had backups before. Now the traffic never ends,” he said. Something that hasn’t changed on the island is the weather. Rain showers are common on the north shore. If your No. 1 vacation goal is to dry out, you may want to head south. That’s where the sun rarely disappears (and where most of Kauai’s large resorts are located, around Poipu and vicinity). Also on the south shore, in Hanapepe, is Talk Story Bookstore, billed as the westernmost independent bookstore in the United States. 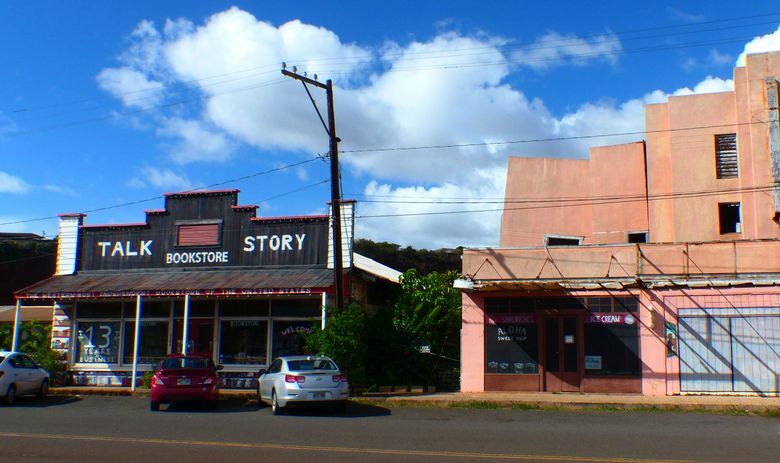 “Talk story” is local lingo for “shooting the breeze,” and Hanapepe is an old community with antique frontier storefronts and an easygoing vibe, though 20 people were killed when police attacked striking Filipino plantation workers there in 1924. The store has rough wooden floors, a sleepy pet cat and rambling shelves. The selection will surprise you and the owners have a great story to tell. Ed Justus and his wife visited Kauai years ago and never left. They opened the store on a whim in 2004 because the space was free for a month. Since then, they’ve sold 150,000 books. Sounds like a nice life, I quipped. “It could be worse, right?” Justus laughed. We were visiting quaint Hanapepe on our way to a much grander attraction. The scale and power of Waimea Canyon makes you catch your breath when you step on to the viewing deck at a lookout 3,600 feet and 25 minutes by car above Kauai’s coastal highway. You’ll swear a talented giant painted the sloping gorge walls and slender valleys with inspired brush strokes, blending oranges, greens and browns. Like the island as a whole, the canyon is a place where adventure can meet tranquillity. 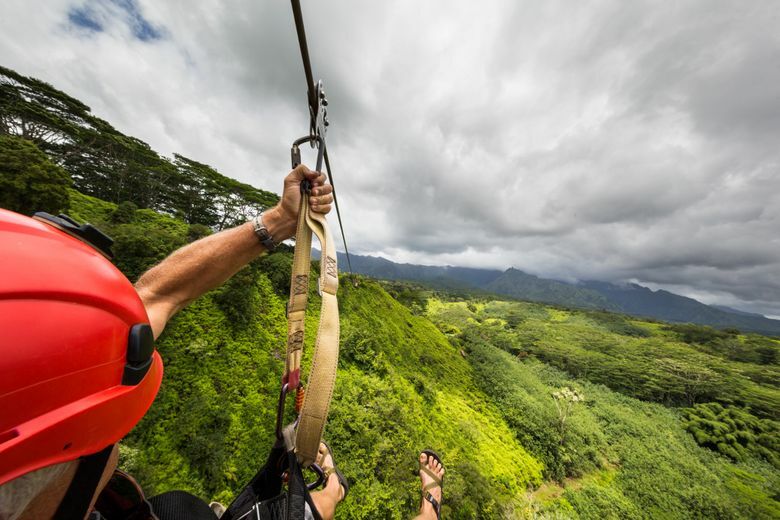 The Outfitters Kauai AdrenaLine zip-line tour is $129 per person. See bit.ly/kauaizip. • Friends found good value at Kauai Shores Hotel in Kapa‘a, with decent rates, basic rooms, a pool, a hot tub and a beachside bar and restaurant with sunset views: kauaishoreshotel.com. 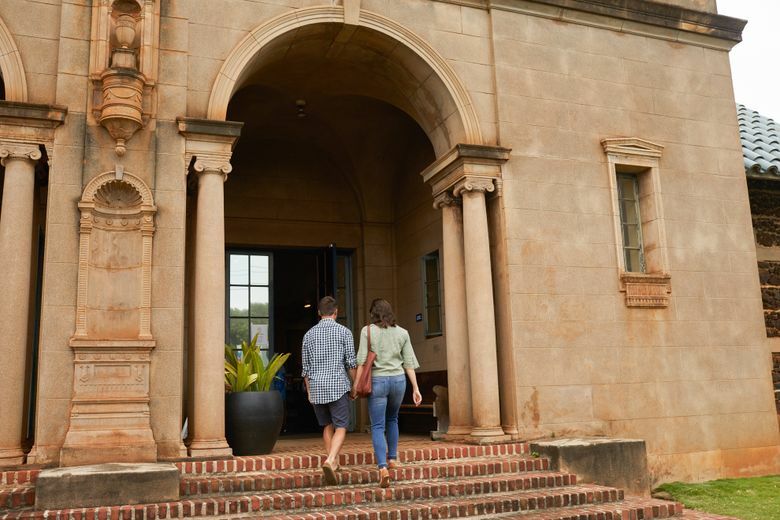 • Rentals booked through services such as Airbnb can be a good way to save money and connect with locals: airbnb.com/a/Kauai. They’re controversial with some residents because they can eat away at housing and hotel-worker jobs. 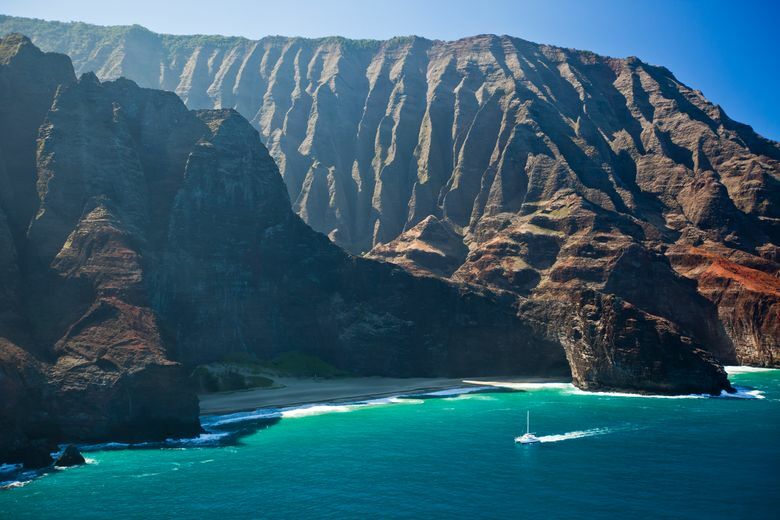 • Visit Kauai’s north shore for mist and the south shore for sun. • Stop by Hamura’s Saimin in Lihue for old-school noodles. 2956 Kress St.; yelp.com/biz/hamuras-saimin-lihue. • Need a beach book? Browse the shelves at Talk Story Bookstore in Hanapepe: talkstorybookstore.com. Daniel Beekman is a Seattle Times reporter who covers Seattle city government: 206-464-2164 or dbeekman@seattletimes.com.